Falun Gong practitioners held an information day in Duesseldorf on February 4, 2017, to introduce Falun Gong and expose the Chinese Communist Party's (CCP) brutal persecution of the practice. 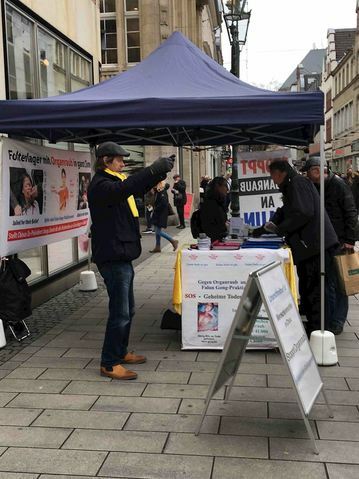 They also exposed the CCP's state-sanctioned organ harvesting from living Falun Gong practitioners. Crowds of people, including tourists, were out enjoying the Old City of Duesseldorf. Many paused to read the practitioners' banners and posters, take flyers or talk with practitioners. A couple from London were shocked at the CCP's brutality, even finding it hard to believe. 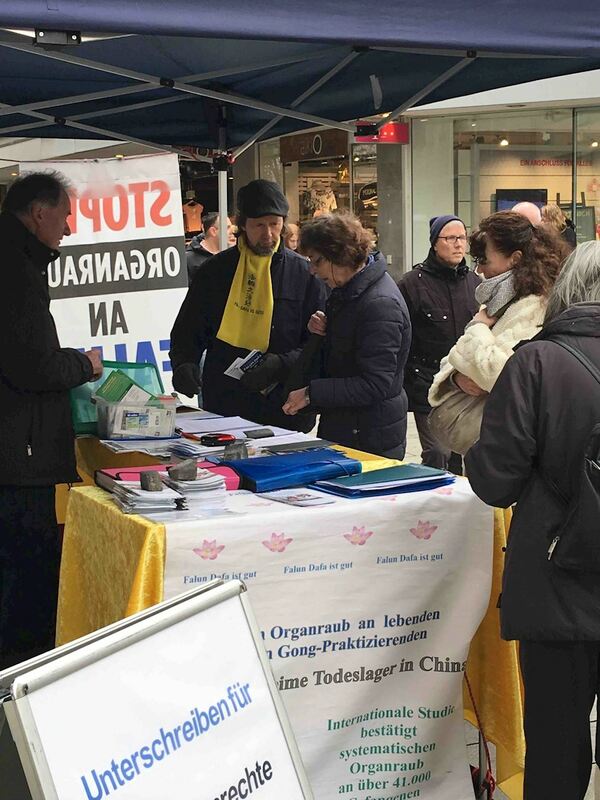 After learning more about the persecution, they signed the petition against the CCP's organ harvesting crimes. They expressed appreciation for the practitioners' efforts to expose and stop the persecution. A woman who is an orthopedic surgeon signed the petition and told a practitioner that many doctors had learned about the CCP's live organ harvesting from professional journals. She discussed the medical ethics with the practitioner. Many passers-by thanked the practitioners and encouraged them to continue the effort to bring the persecution to an end.